Science fiction, at its best, does not so much predict the future as look at the present with unusual eyes. William Gibsons new novel Pattern Recognition is like that, submerging us in a world we instantly recognize and yet cannot quite understand. 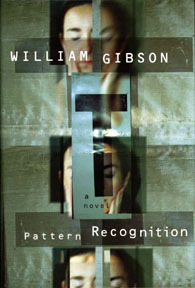 Gibson may be familiar to some as the inventor in a previous novel of the term cyberspace. His subject here could not be more current, more up to the nanosecond: how aggressive marketing in an ever-more-commercialized globe is destroying individuality, until soon there may be no national identity left. The novels heroine, Cayce Pollard, is a free-lance marketing consultant with a nose for trends. As a cool-hunter she seeks to identify what the next BIG THING might be, the next hula hoop, the next skateboard, the next NIKE logo. Her billionaire employer Bigend asks her to track down the source of a collection of 135 mysterious film clips posted on an internet message board. The clips, highly sophisticated, have developed a worldwide cult following, and Bigend wants to know how it was done. Is this some new approach to molding perception? Or is it merely an illusion of meaningfulness, faulty pattern recognition? In Bigends world, the creative process is no longer contained within an individual skull, if indeed it ever was. Everything, today, is to some extent the reflection of something else. Pattern recognition. I love a novel that challenges my thinking in as many ways as this one does.